Campeggio La Grande Vallée si trova a La Tranche-sur-Mer, Vandea. Questo campeggio dispone di piazzole sia ombreggiate che, senza ombra e piazzole poco ombreggiate. È possibile affittare casemobili. Il campeggio dispone di un parco giochi. Ogni anno un ispettore visita il Campeggio La Grande Vallée, controllando oltre 200 tra attrezzature e altri punti di interesse del campeggio. L'ispettore è un dipendente ACSI e non lavora per il campeggio. A small site and emplacements can be a little tight and close together. However the location is excellent. A short walk to a beautiful beach and the town of La Tranche is less than a 10 drive with plenty of free parking.Toilets and showers were good with plenty of hot water. There is a small supermarket next door for you daily bread and basic needs.Our plot at the bottom backed on to afield with lovely views.Young owners were lovely and helpful. Would definitely use site again. We have visited this campsite many time for a week\'s holiday. It\'s close to the beach and has excellent cycling. Arrived on Friday had a nice day on the beach lovely relaxed site until 12am when woken by loud music and shouting from disco up the road until 6am.Spoke to the owner who said the disco was on again on Saturday night she was unconcerned and rude so we left the area very disappointed will not return. Friendly staff with good English spoken. Good atmosphere on site but disco opposite was very noisy and lasted well into the early hours. Excellent shop next door and fifteen-minute walk to lovely beach. We had an excellent stay on this family run site. The owners Sam & Virginie are so friendly & helpful. It's about 4 miles to cycle into La Tranche. Lovely beach within walking distance of the site. Excellent shop next door very well stocked makes his own delicious Grande Vallée pâte ! We only camp in low season but will definitely return one day to see how the owners have progressed as they are always trying to improve their facilities ! Volete prenotare il campeggio Campeggio La Grande Vallée o oppure saperne di più? Potete farlo usando i seguenti dati oppure tramite il sito del campeggio. Da La Roche-sur-Yon D747 verso La Tranche. Seguire i cartelli per La Grière-Plage, quindi le segnalazioni per il camping. 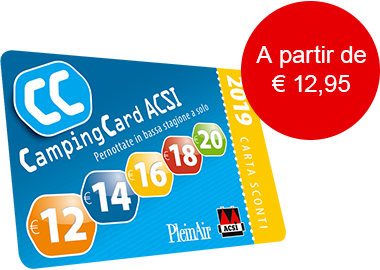 ACSI Eurocampings invia la tua richiesta di informazioni al "Campeggio La Grande Vallée".